Subscription payments are fantastic if you are offering a paid forservice that you would like to charge monthly or yearly fee for. For example if you would like to offer memberships for your own club or lesson. In this guide we will look at GoCardless and PayPal, two payment gateway providers that can be used with Create to offer this service. GoCardless is a great way to accept Direct Debit subscription payments online from UK accounts alone. It's simple and easy and means you can setup recurring payments from your Create site for your customers. This is ideal for websites with customer accounts. This will create your merchant account instantly and from here you can create your own subscription payment plans, adding customers to the plan as they wish to subscribe. Once this is verified by the customer you can then take the payment and the funds are transferred into your bank account after 7 working days. You could always make a link to your payment plan in the form of a GoCardless button and add this as an external HTML Fragment to your site. This is a quick and easy way to get customers to sign up to your GoCardless payment plan. To find the code for this button please click here. You can then read instructions on how to add this to your Create site here. For more information on how Paylinks work with GoCardless please click here. If you already have a PayPal account you can always use PayPal’s Subscriptions and Recurring Payments service to take payments from your customers. This is easy to setup and provides a simple button that your customer can click to setup their recurring payment agreement. You can then setup your Subscription button to add to your Create site and start taking your subscriptions! Under “Selling online”, in the 'PayPal Buttons' section, click Update. 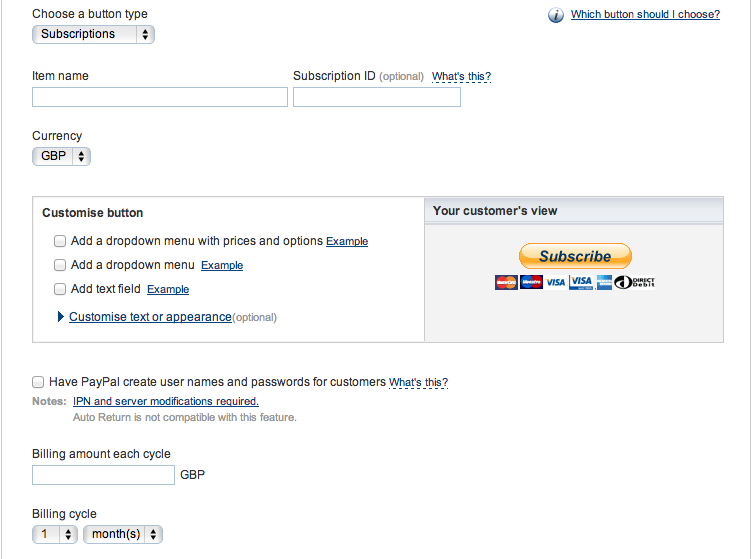 In the “Accept payments for” drop-down menu, select Subscriptions and recurring billing and fill in all required fields. Click Select Code to select the button code. How can I remove a payment gateway from my shop?